New Ergonomic Design - Aggressive knurling on the focus knob and lens shade provides sure, positive adjustment, even with gloved hands. The Multicoat 4® lens system ensures maximum brightness, clarity, contrast, and color fidelity. Generous Eye Relief - Comfortable twist-up eyecups and non-critical eye relief makes long glassing sessions a breeze. Retractable Lens Shade - eliminates glare on the lens to improve picture quality. 100 Percent Waterproof and Fog Proof. Rugged construction and sealed optics withstand the worst of the elements. Tripod Ready - A built-in, rotating tripod port makes it easy to mount. Covered by the Leupold® Limited Lifetime Warranty. Compact Adjustable Tripod - with multi-directional tilting head and non-slip feet. 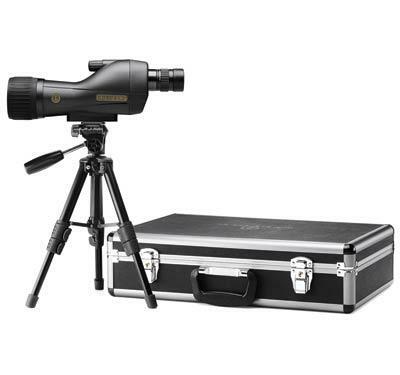 Click the button below to add the Leupold SX-1 Ventana 15-45x60mm Straight Spotting Scope Kit to your wish list.